Time magazine says Federal Reserve Chairman Ben Bernanke "led an effort to save the world economy." GOP senator and critic calls Ben Bernanke "moral hazard"
Time magazine calls Bernanke, 56, " the most powerful nerd on the planet"
(CNN) -- Time magazine on Wednesday named Federal Reserve Chairman Ben Bernanke as its 2009 Person of the Year, calling him "the most powerful nerd on the planet." Bernanke is considered a scholar of the Great Depression. A series of his writings were compiled into the book "Essays of the Great Depression." Michael Grunwald, who authored Time's article, on Wednesday told NBC's "Today" that "basically [Bernanke] saw what looked like another depression coming, and he decided he would do whatever it takes to forestall that. And basically, I think he did. It could have been a lot worse." Grunwald said, "There are things that he could have done better. One of his responsibilities is for full employment in society, and he hasn't really stepped up on that, but basically in terms of influencing how the economy went this year, Bernanke was the guy." The Time senior correspondent added, "Look, he's been criticized from left and right, from liberals and conservatives, you know, for ... running the unelected fourth branch of government. He's a controversial figure." Wednesday's announcement comes a day before a Senate Banking Committee vote on whether Bernanke should be given another term. "Remember, he's a Republican appointed by a Democratic president. It's the Democrats on the committee that are going to vote to confirm. It's a really interesting combination of factors," Grunwald said. One of Bernanke's harshest critics is Sen. Jim Bunning, R-Kentucky, the only senator to vote against the economist's appointment four years ago by President Bush. "But if Time magazine is in the business of rewarding failure, Ben Bernanke is their man -- he has certainly excelled at that." Bunning called Bernanke a "moral hazard," accusing him of supporting the "easy money policies of his predecessor, Alan Greenspan," who made the cover of Time in February 1999, along with then-Treasury Secretary Robert Rubin and his successor, Lawrence H. Summers. Another sharp critic of Bernanke, independent Sen. Bernie Sanders of Vermont, said December 2 that he plans to place a "hold" on Bernanke's nomination for a second term once it leaves the Banking Committee. A "hold" is an informal practice in which a senator informs the majority leader that he or she does not want a bill or nomination to reach the floor for a vote. Majority leader Sen. Harry Reid, D-Nevada, would not need to act on Sanders' request, but Sanders could launch a filibuster to delay the motion to nominate the Fed chairman for another four-year term. "The American people overwhelmingly voted last year for a change in our national priorities to put the interests of ordinary people ahead of the greed of Wall Street and the wealthy few," Sanders said then, explaining his action. "What the American people did not bargain for was another four years for one of the key architects of the Bush economy." 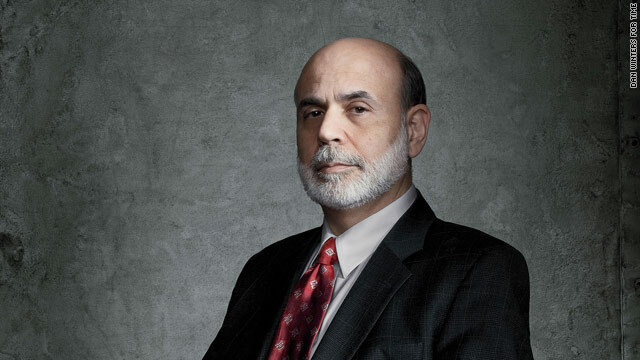 Time magazine noted that Bernanke, who turned 56 Sunday, defies the stereotype of "a typical Beltway power broker." "He doesn't have a commanding presence. He isn't a mesmerizing speaker. He has none of the look-at-me swagger or listen-to-me charisma so common among men with oversize Washington offices," the article said. Bernanke was sworn in as Federal Reserve chairman in February 2006. He spent years in academia, as a professor at Princeton, Stanford and New York universities and the Massachusetts Institute of Technology, according to the Fed's Web site. Time magazine, like CNN, is a unit of Time Warner.